Hereford Inlet Light (center). The trees are part of its gardens, which also have benches along this walkway, the North Wildwood Seawall. The Hereford Inlet Lighthouse was built in 1874 and is the most important historic structure on Five Mile Beach. The Lighthouse is open to the public and continues to function as an active navigational aid maintained by the United States Coast Guard. Visitors to the Lighthouse will learn about the history of the building and the local area. 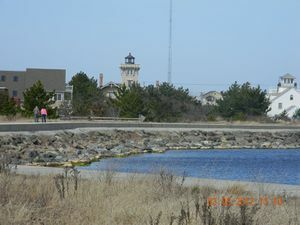 The Lighthouse grounds are a great place to relax and take in the ocean air, and a stroll the gardens will allow visitors to enjoy the beauity of the seashore right up to the seawall at Hereford Inlet. In my view, this and the George F Boyer Historical Museum are the two essential Wildwoods experiences. This has a great little museum inside, including the climb to just under the light room, where you can enjoy a lookout view. The gardens are also outstanding: tranquil and beautiful, with lots of species and varieties. From there you can step out to the set of benches next to the North Wildwood Seawall. My favorite time for sitting there is late on a foggy or misty night, when you can see the light beam sweeping overhead. If you still have some pep in your legs, the Seawall walkway provides an immersive ocean view that's downright thrilling if the water's choppy. This page was last edited on 27 October 2018, at 14:47.